The Cleveland Cascade is located in Oakland, California, on Lake Merritt. It ascends from Lakeshore Ave., which runs along the shore of the lake, to Merritt Ave. and the San Antonio neighborhood. The Cascade was originally just one block of Cleveland St. In 1923 it was deemed too steep and reconceived as a park. The park consisted of a set of terraces connected by parallel stairways. Between the stairways was a stunning Italian-inspired water feature, designed by noted landscape architect Howard Gilkey. Water cascaded down between two stairways, through a series of bowls, illuminated at night from within by colored lights in rainbow sequence. 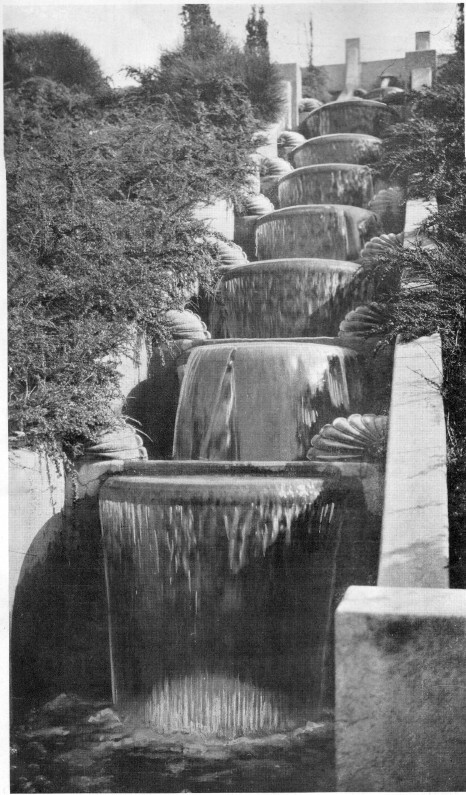 What we know about how the Cascade looked and worked is mostly derived from a 1923 article in the San Francisco Chronicle (probably published not long after the Cascade’s inauguration), which provides a verbal description and photograph of the entire Cascade from the pool at the bottom. There is also a photograph, published in a 1931 article by Howard Gilkey, shows the lowest tier of the Cascade, providing the clearest and most-detailed visual record we have of what the flowing water looked like, and of details of the concrete basins, bowls, and shell-shaped light shields. The cascade and the stairs were arranged in three tiers with landings between them. The bowls of the cascade were each housed in a rectangular basin. There were seven basins in the top and middle tiers, and six in the lowest. At the bottom the water flowed into a pool, from which it was recirculated by an electric pump back to the top. Each basin was 41″ wide (inside measurement), adjoined on both sides by 6.25″-wide concrete walls running the length of each tier. The back (i.e., uphill side) of each basin rose 24.75″ deep above the basin’s floor; the front (i.e., downhill side) of each basin rose 6″ above the floor. The wall separating each basin was 6-3/8″ thick. Near (3″ below) the top of each basin-separating wall was a slot (10-3/8″ wide, 1.5″ tall) through that 6-3/8″ wall, which allowed water to flow from the basin above. This water flowed into, filled, and overflowed a shallow saucer-like bowl, which was attached to the back vertical wall of each basin and spanned the basin’s width. At some point before 1950, the water feature slipped into disrepair and was turned off. Sometime after that the concrete basins were filled in with dirt and planted with rosemary bushes. The saucers and shell-shaped shields were removed and/or smashed. Time passed and the fountainworks were mostly forgotten. We don’t know what became of that effort. Times and people involved changed, and the effort lapsed. Friends of the Cleveland Cascade is an Umbrella Partner under Friends of Oakland Parks & Recreation.